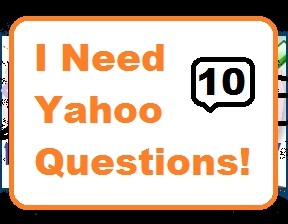 I Need 10 Questions Asked On Yahoo Answers! I need someone to ask 10 questions on Yahoo Answers for me so i can then answer them with my link in the source box. I will give you the text for the questions, you just have to copy and then paste when doing it. I will also tell you the categories to ask them in. Thanks! You must ask the questions, then reply to me with the links to each of them so i can answer them. You Must select my answer on all the questions as "Best Answer". I have set the Days To Complete for this at 5 Days as im happy for you to ask 2 per day if you want, or you can indeed ask them all at once, its up to you.. Thanks! as the buyer asked i can do it. hi,if you wish,then i can make both question and answer in yahoo, then i will choose best answer.i can make best answer if you provide question and answer in yahoo or keyword. i have 20 level 2 yahoo answer account in my hand.also i can make level 2 yahoo answer account less than 2 days. remember me . i did job for you past. however i can do it , if you did not hire anyone you can hire me for this job . i can do it with your full satisfaction . hi, i have many accounts in yahoo answer with 2-3 levels.so i can give you questions as soon as possible. i can complete this project.